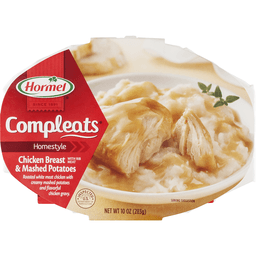 Hormel® Compleats® Chicken Breast & Gravy with Mashed Potatoes. Since 1891. With rib meat roasted white meat chicken with creamy mashed potatoes and flavorful chicken gravy. 18g protein. Ready in 60 seconds. Inspected for wholesomeness by U.S. department of agriculture. Fast facts 18 protein. 800-523-4635. hormel.com. 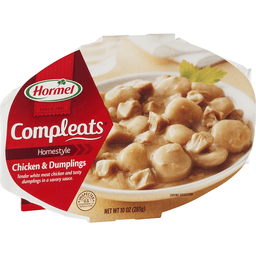 ©Hormel Foods, LLC.